The braking system is one of the most important safety features on your vehicle, so it is imperative that you care for it appropriately. Certified technicians in the Parts and Service Department at Prestige Imports will provide you with a variety of Porsche or Audi Brake Services in order to ensure that your vehicle performs properly and at its peak performance. Although many specialized parts work in conjunction with one another for a modern, disc braking system to function properly, the concept underlying it is rather simple. When a driver depresses the brake pedal, it forces a rod (within the brake booster) into a valve at the end of the master cylinder. This action compresses two pistons, which direct hydraulic brake fluid from a reservoir into the fluid lines and toward a caliper mechanism. The pressure created from this action forces the caliper, which is lined on either side with brake pads, to clamp down upon the rotor. The rotor, which is attached to the axle, stops the wheel from moving forward. To prevent any major or long-term damage, both Audi and Porsche recommend regular brake system maintenance. As part this preventative care, both manufacturers suggest a brake flush every two years or 20,000 miles. A brake flush requires that a technician replace the brake fluid. This is a necessary, periodic service due to the nature of the fluid. Brake fluid is hygroscopic, meaning that it absorbs moisture in the surrounding atmosphere. Overtime, accumulated moisture within your brake lines will lead to corrosion, deterioration of hydraulic parts, and, eventually, brake failure. 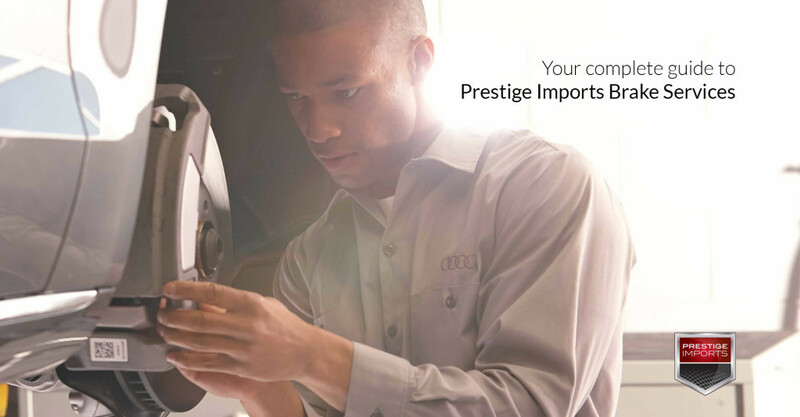 For any of our Porsche or Audi Brake Services, call Prestige Imports Parts and Service Department at (833) 825-5423 to schedule an appointment with a certified Audi or Porsche technician. They can test your braking system and replace any worn parts.